When a client or potential client receives a pocket folder, what lasting impacts result from this transaction? Every presentation piece delivers messages, subtly or overtly, that solidify the brand identity. The stock is the first, and perhaps most important, decision to make when creating a pocket folder. Consider the weight, the texture and the color. For example, the weight of the stock can instill trust by conveying stability. Colors and processes all evoke emotional responses; consequently, certain industries tend to use deep blues and rich greens to convey conservatism and security. Then there’s texture. By maximizing the tactile impact, messages are literally sent through the fingertips to the brain of the consumer. The most popular folder of all time is the 9 x 12 with two pockets. Applause, applause, the crowd goes wild! However, not every business or correspondence is best served by this common style. Obviously, the 9 x 12 holds an 8.5 x 11 sheet. Guess what? A 6 x 9 holds that sheet folded in half, and a 4 x 9 holds that sheet folded in thirds. 4 x 9s also fit in a #10 envelope, the perfect size for sending quotes, invoices, introductory information, and so on. Consider this option for small businesses or even particular departments. They are better served utilizing these folder options, which are often more cost effective and extremely practical. Another folder style that speaks volumes to an end user is the tab folder. What does it say? “Let’s make finding me, your new favorite brand, accessible and adaptable. My brand and my information are both on and in this handy tab folder which you will put in an important, easy-to-reach spot.” Great idea! Now that you’ve made your first impression, leave a lasting impression with the finishing touches. Add a gloss UV coating to brighten the sheet or a soft touch lamination to provide a durable, sensual impact. Of course, our favorite is to combine processes, like a print and polyfoil or dimensional UV effects. These options “pop” copy and logos, accentuating the message. I could go on and on about our exciting new finishing options and techniques. In fact I do via our Ideas portion of the Pocket Folders Fast website. For more about finishes and texture options specifically, and how they impact memory and emotional response, check out our articles: Hot to the Touch, Part One and Part Two. 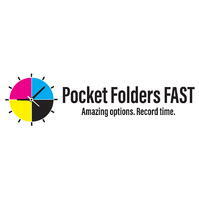 Click here for your complete distributor sales kit from Pocket Folders Fast that includes several samples of stocks, styles, and finishing options to help your clients create their best presentation. 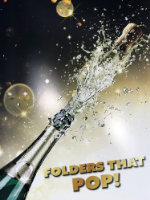 Plus: Be on the lookout for the February issue of PS magazine, which will feature the latest in technologies and tips about creating and selling pocket folders and binders. You won’t want to miss it!